They say all genius has madness contained within it, and that mantra is one that Motorola seems to have embraced with the MOTOAURA, as it attempts to design its way out of the crisis it has found its handset arm in. 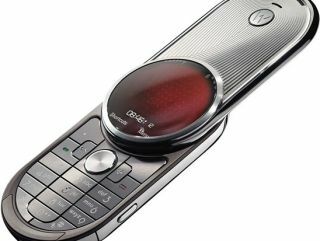 The new device features a twist-to-open screen, making it a similar handset to the maligned V70, debuted in 2002, which used a similar system. But the rebirth of the design means the screen estate has to be re-imagined, something the phone hasn't managed to do according to Mobile-Review. The engineers have only tweaked the interface to fit into the new 1.58-inch screen size (roughly, as it's hard to measure a circle in the same way you would a normal shaped screen). According to the specs, this handset has no memory card slot, but does come with 2GB internal memory. It doesn't work on 3G, so the internet won't be too fast, though how well it will render in a circular screen is anyone's guess. It only has a 2MP camera, which shows this handset is aimed squarely at the fashion market, and only comes with an 810mAh battery, good for around seven hours talk time. Defined as 'coming soon', we'll let you now when, or even if, we can expect the handset on UK shores.